Chanteur et multi-instrumentiste Country US né Jimmy Ray Dean , le 10 Août 1928 à Seth Ward, Plainview (Texas). 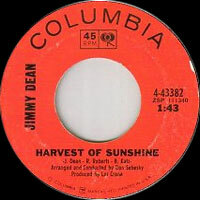 Jimmy Dean a débuté lors de son service dans l'Air Force, jouant avec les "Tennessee Haymakers". Libéré en 1948, Jimmy monte les "Texas Wildcats" et se produit dans la région de Washington. 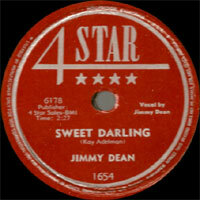 Premier succès en 1953 sur le label 4Star. Après plusieurs singles pour Mercury, il devient la vedette d'un show télévisé dont la popularité lui procure un contrat avec la Columbia Records. Jimmy était un excellent Vocalsiste, spécialisé dans la narration. Il est décédé le 13 Juin 2010. 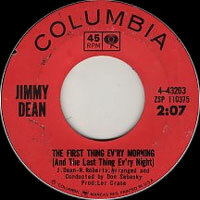 The average man on the street would most likely recognize Jimmy Dean from the line of smoked sausage that bears his name, but prior to entering the pork products business, Dean was a successful television personality and a country hitmaker noted for his half-spoken narrative songs. Dean was born near Plainview, TX in 1928 and grew up poor, often working on farms as a boy to help make ends meet. His mother taught him piano starting at age ten, and he went on to pick up guitar, harmonica, and accordion. He joined the Merchant Marines at age 16, and after two years he enlisted in the Air Force, where he first performed publicly with a band called the Tennessee Haymakers. The Haymakers played venues near the Washington, D.C., base at which Dean was stationed, and when he left the service in 1948, he remained in the area and formed a new group called the Texas Wildcats. He eventually scored a record deal with Four Star, and his first hit, "Bummin' Around," reached the country Top Ten in 1953. During the mid-'50s, Dean hosted a local television show devoted to country music, giving important early exposure to regulars Patsy Cline and Roy Clark. The show proved popular enough that CBS offered him his own national program in 1957, though it wasn't as successful. In the meantime, Dean signed with Columbia, and when his show was canceled, he recorded a series of singles for the label that didn't get much attention. 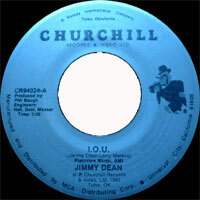 That all changed when he recorded the self-penned "Big Bad John" in 1961. 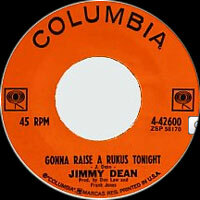 Establishing Dean's flair for spoken narratives, the song went to number one on both the pop and country charts. He followed it with a string of popular singles in 1962: "Dear Ivan," "Little Black Book," and "P.T. 109" (the latter about John F. Kennedy's war exploits in the South Pacific) all made the country Top Ten, and the latter also made the pop Top Ten. 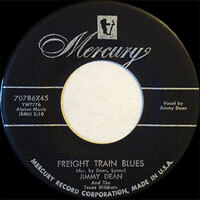 Meanwhile, "To a Sleeping Beauty" and "The Cajun Queen" reached the country Top 20; all of Dean's hits from this hot streak charted at least in the pop Top 40. In 1963, Dean returned to television as the host of his own daily variety show on ABC. Roger Miller became a regular, helping to jump-start his career, and the show also helped introduce America to another talent: puppeteer Jim Henson, whose regular appearances made Rowlf the piano-playing dog the first Muppet to become a household name. 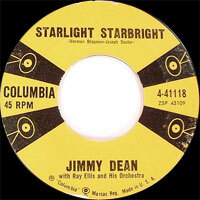 The Jimmy Dean Show ran until 1966, by which point Dean had switched labels to RCA; he returned to the country Top Ten that year with "Stand Beside Me," and placed several more minor chart entries through 1971, leaving off with "Slowly," a Top 40 duet with Dottie West. In the meantime, he developed an acting career, appearing as a regular on the TV series Daniel Boone during the late '60s, and landing the part of reclusive billionaire Willard Whyte in the 1971 James Bond flick Diamonds Are Forever. Dean had invested most of his showbiz earnings in hog-farming concerns, and founded the Jimmy Dean Meat Company in the late '60s. His sausage recipes soon turned into a popular mass-market product, and while he accepted the occasional guest acting role on TV during the '70s and '80s, he spent most of his time focusing on his burgeoning business. 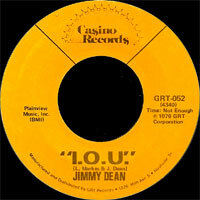 He recorded a bit more for Casino in 1976, landing a final Top Ten country hit that year with "I.O.U.," a narrative tribute to his mother. Dean eventually sold his meat company to Sara Lee Foods, but remained its TV spokesman until he was let go in a less than amicable split during 2003. In the years thereafter, Dean was in semi-retirement at his estate outside of Richmond, VA, where he died at age 81 on June 13, 2010. 10/1955 78 t. MERCURY 70745 (US) . Find'em, Fool'em, Leave'em Alone / My World Is You? 10/1955 SP MERCURY 70745X45 (US) . Find'em, Fool'em, Leave'em Alone / My World Is You? 1962 SP COLUMBIA S7-31551 (US) . Nobody / Have You Ever Been Lonely? 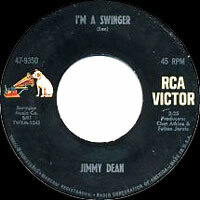 03/1969 SP RCA VICTOR 74-0122 (US) . Rose Is A Rose / ? 02/1971 SP RCA VICTOR 47-9966 (US) . Everybody Knows / ? 07/1971 SP RCA VICTOR 48-1006 (US) . These Hands / ?